Elvis Presley’s reception in San Antonio on April 15, 1956, revealed how sudden and explosive his rise to stardom had been in the early months of his breakout year. When he signed with RCA Victor in January, he was an unproven quantity outside of the South. Although he’d been seen on network TV seven times by early April, his controversial appearances on the Milton Berle and Ed Sullivan shows were all still ahead of him. He had yet to have a #1 record. (“Heartbreak Hotel” was still three weeks away from topping Billboard’s “Top 100.”) And yet, all the elements of Presleymania were in place when he flew into San Antonio in mid-April. San Antonio was the mid-point stop on Presley’s 15-city tour that month, beginning in San Diego and sweeping across Colorado, Texas, and Oklahoma before ending with a two-week stint at the New Frontier Hotel in Las Vegas. April 14, the day before the San Antonio shows, was one of the few open dates on the tour. 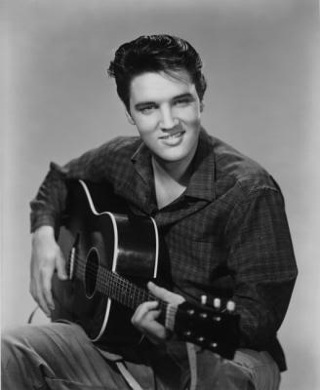 After appearing in Amarillo on the 13th, Elvis and his band flew to Nashville for a recording session. (The harrowing mechanical and navigation difficulties during that private flight convinced Elvis to avoid flying in the future.) After the session, which produced his next single, “I Want You, I Need You, I Love You,” Elvis and the guys flew into San Antonio on a commercial flight. Meanwhile, Elvis was backstage entertaining a gathering of journalists and fan club officers. “This is just a dream,” he responded to a question, while sipping a soft drink. “It makes you feel good. I’ve got everything a boy ever dreamed of having.” In their articles the next day in competing newspapers, Ashford and Scheibl provided different versions of another Presley response. 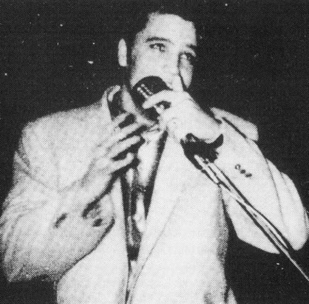 Ashford reported that when asked if he gotten mobbed wherever he went, the singer answered, “Well, if I said yes I’d be braggin’, but if I said no I’d be lyin’.” Scheibl claimed Elvis made that diplomatic response to a different question—if he had had any marriage proposals since his rapid rise to fame. 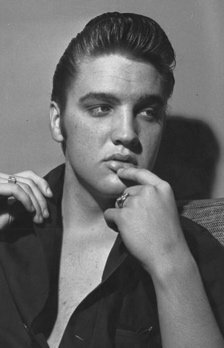 Elvis also revealed that he felt “real good” when he got three or four hours of sleep, and that he had been presented with a gold record for “Heartbreak Hotel” at his Nashville recording session the day before. At 4:30, Elvis, wearing a white silk jacket, black pants, and a blue satin shirt with a mandarin collar, prepared to take the stage. Seven of the ten policemen on duty in the auditorium held back the crowd from pouring over the orchestra pit and onto the platform. “The floor between the first row and the pit was a sea of full skirts,” Scheibl noted, “as Elvis worshippers crouched and crawled into position, cameras at the ready.” But they were forced to move back when Elvis came on. The banner headline over Ashford’s review in Express the next morning read, ROCK ’N’ ROLL STAR STIRS NEAR RIOT. As usual with Presley shows in the fifties, the use of the term “riot” was an exaggeration. At the end of the first show, Colonel Parker, obviously not yet completely aware of the passion his client stimulated in teenage girls, set up a table outside the auditorium and invited those wishing autographs to line up. Elvis appeared, but about 3,000 youngsters stormed the table and forced him to flee back to his dressing room. The crowd followed, jammed up against the auditorium’s west stage door entrance, and began chanting “We want Elvis.” At one point, Elvis appeared at an upstairs window and waved at the throng. In fact, one 17-year-old girl, who had fainted in the crush, had to dragged away by security guards. In his dressing room, Elvis assisted the officers in reviving her. Ashford reported that Presley then looked into her eyes and asked how she felt. “I feel wonderful” was the predictable reply. Knowing it would be unwise to leave the building before the crowd dissipated, Elvis passed the time with a few reporters inside the deserted arena. He sat down at the keyboard of the auditorium’s big pipe organ. “These things fascinate me,” he said, as he hit a few notes at random. He then played what Ashford called “passable renditions” of “Silent Night,” “Harbor Lights,” and several other tunes. 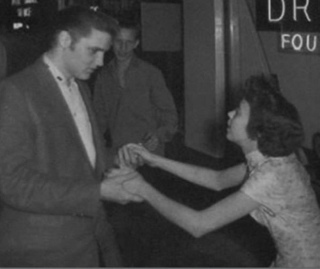 The Walker interview was one of many Elvis granted local DJs while he toured the country in the first half of 1956. By April Colonel Parker had not yet realized that his boy was beyond having to coax jockeys into playing his records. Elvis closed his San Antonio interview with Walker by massaging the DJ’s ego. "A flash of white teeth from Elvis, a loose hipped slur of dance steps, a Brando-like gaze from soulful blue eyes, and the floor vibrated with 6,000 stamping feet."